Weekly, I survey the Gage Gardens which is just south of the railroad tracks from the Gage Hotel. The Gage is making a specific effort to attract native birds, at the Gardens, for visiting birders. Last time out I observed 40 species. This time, the species-count was slightly down though no less enjoyable a time. 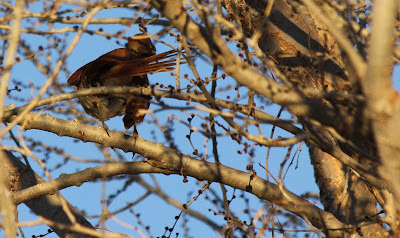 I've been having a difficult time tracking down and photographing a skulker of a Brown Thrasher. 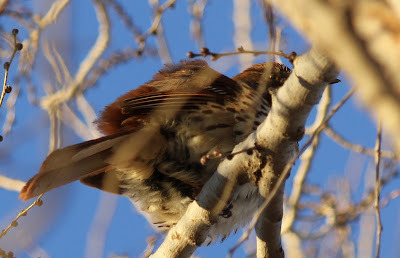 Today, early in the cold morning I found the bird preening high in a tree. This was my best opportunity of the winter. Check out that eye and dark, defined streaks on the sides and flanks. 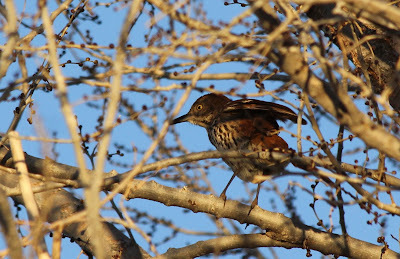 We've enjoyed a Brown Thrasher in our yard here in town. 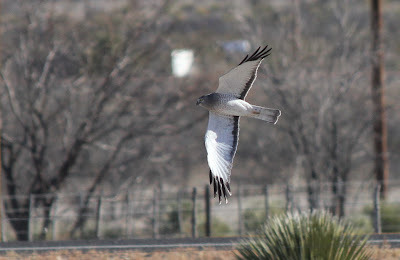 And the Gage Gardens has been as reliable a spot in north Brewster County for this bird. An uncommon species though certainly present down on the river, it's not often thought of northward out here. 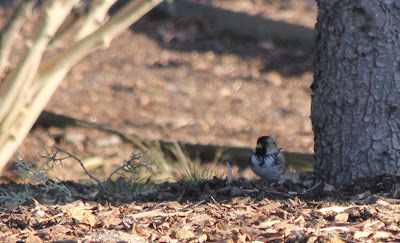 I was particularly interested in locating two sparrow species that are excellent out here. I found the Rare one of the two. A large sparrow with a narrow normal range, the Harris's Sparrow is listed Rare in the trans-Pecos of Texas. I saw it again this morning, however I had no luck later in the morning. A great bird, uncommon even where it is supposed to spend a winter. As always Lark Buntings are numerous. By numerous I mean pushing four digits. Large flocks. They love the high-desert grassland. 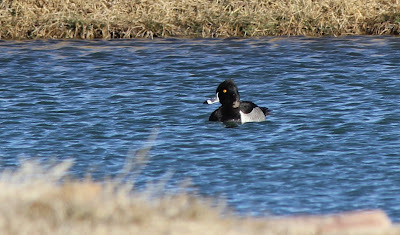 A nice surprise were three Ring-necked Ducks on the pond at the SE corner of the property. There were two males and one female. Then, they decided to head out for the day. Also flying low in that general half of the back grassland is a raptor formally known as the "Marsh Hawk" and "Duck Hawk". Hmmm. 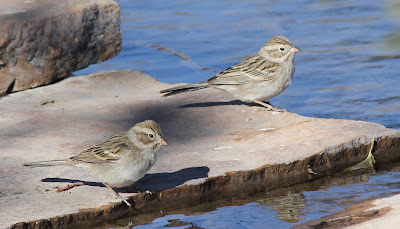 In the winter there are numerous Brewer's Sparrows. 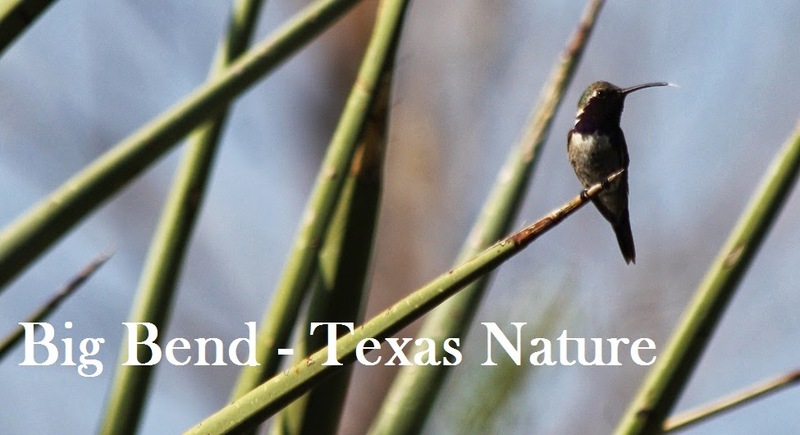 Sometimes less than conspicuous, they are a sought after bird for many; particularly for those from the rest of TX. The reside here in far-West Texas, again, in the winter. 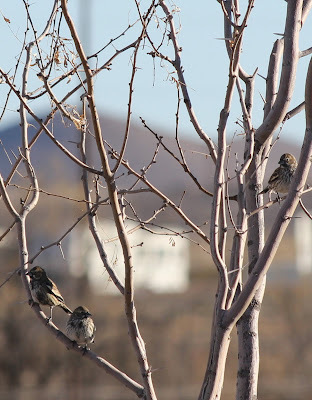 And finally, our year-round icon in the Chihuahuan Desert, the dapper Black-throated Sparrow. 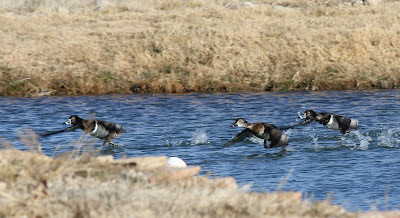 The following list generated by ebird.org. 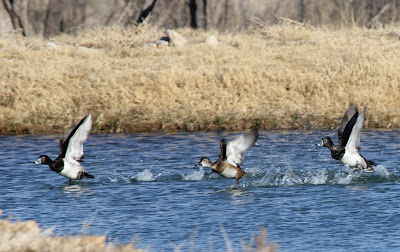 3 Ring-necked DuckDelete 2 males : 1 female. At the pond on the SE side. The back half, which is native grassland holds many. That number is likely conservative. No FOXS this particular obs. The HASP was seen early in the survey, not later in the AM. Large, black mask and crown short of the nape, beige face pink bill, white belly. This seemingly one individual was seen at the same location. Photos available then, new photos of this bird available though they aren't as good. The bird scratched around under mottled shade at a feeder location. An excellent bird, the previous encounter with it was a Brewster County record for me and Heidi Trudell. BBNP - Northern Parula winters. One among the Ferruginous beings. 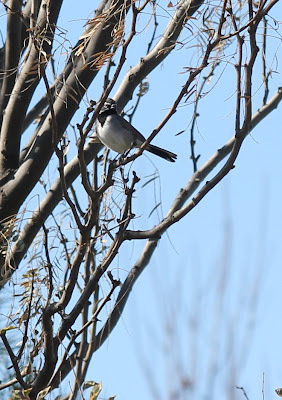 Probable Nutting's Flycatcher - update! Just for fun. Recent, record, memories.